Cool Hand Burg: Very Funny . . .
Picture yourself as an Italian living in Rome. You go to the grocery in search of a frozen pizza (apparently this happens?). 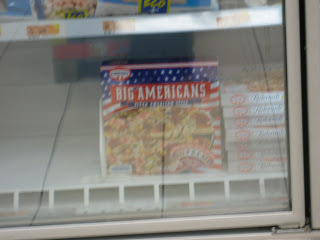 You find one: "BIG AMERICANS: PIZZA AMERICAN STYLE." What do you do? You laugh, suppress that gag reflex, and buy something...oh god, anything...else.